Ah so glad to hear you enjoyed this one! The synopsis didn’t completely sell it for me either, and I wasn’t even sure if I would read it, but I ended up getting in an Owlcrate box. Good to know it’s as good as everyone is saying it is! Great review! Thank you! 😀 I really hope you enjoy it when you read it! I like a good slow burn, so I adored the romance in this one. Yesss, I loved how slow the build-up was! It made it much more meaningful to me – I remember going into it a little bit worried that it would be too quick to be believable, but they definitely have to earn each other’s trust and all. ♥ *swoon* haha! I have been so on the fence with this one! I have picked it up at BN and put it down more times than I can count. It is now competing with Malice haha. Your review has me decided it it worth a read though 💜 I just have been uncertain of what to expect, but this sounds great! Hahahah I’m cracking up over the Malice comparison! 😀 Okay, phew, no pressure, right? 😉 I hope you enjoy it if you read it! OMG I love this so much!! Still one of my top reads this year and I LOVE YOUR REVIEW! It’s perfect 💚 so happy you enjoyed it. So glad to hear you liked this! I listed to Adrienne’s podcast on First Draft which made me want to read this, but the reviews are all over the place. Yeah, reviews are a bit scattered, aren’t they? I think we see that so often with books that come in book sub boxes, too – I feel like I always see lots of mixed reviews for anything that gets sent out to people as a “surprise”! I’m so glad you enjoyed it. I loved it! AHHH I can’t wait to read this after seeing this review! It sounds awesome! Yaaaay, I hope you get to read it soon and that you love it! I loved this too! And I was surprised, I’ve had bad luck in general with YA lately. I’m glad you loved it! Aw no, I feel like this year has been SO hit and miss for YA, especially YA fantasy! Wonderful review, Destiny! I have been afraid to pick this one up because of the hype and my overwhelming obsession with Vikings and Norse mythology, but I might have to give it a try. *chants to self repeatedly that she is on a book ban* The temptation is real! Dude, RIGHT? That’s me right now with The Death of Mrs. Westaway and The Kiss Quotient – I keep seeing both of them everywhere, the hold list at the library is MONTHS for the audiobooks and I can’t get the physical copies on hold yet (my system won’t allow loans from other branches until a book has been out 6+ months), and I’m just trying to remind myself that I have a LOT of ARCs to read in the next couple of months and that I need to be patient and wait until my book ban “break” at the end of August. You know, it’s funny that you mention that, because I love vikings but I had to get in the right “mood” for this one! This sounds great! I will definitely pick it up! Great review! Thank you so much! 🙂 That makes me happy. I hope you like it! Oooh, this is going on my immediate TBR!! Haha yay!! I hope you love it! 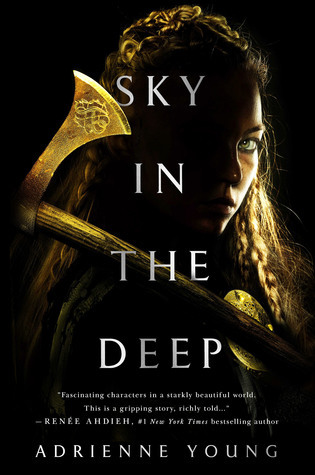 I really enjoyed Sky in the Deep. Thank you, Cora! I’m so glad you enjoyed it, too. What did you think of the romance? Same, I appreciated that a lot! I’m listening to this on audiobook right now!! Started last night and I’m already half way through! LOVE IT so far!!! Great review, Destiny!